TISCO Foundation: มอบทุนรักษาพยาบาลให้กับเด็กชายจิรภัทร ตะเพียนทอง ที่โรงพยาบาลเด็ก - TISCO Foundation donated a medical care grant to Jirapat Tapienthong at the Children's Hospital. 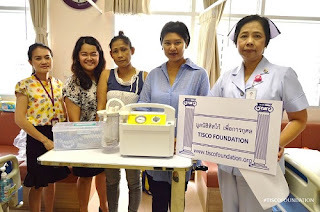 มอบทุนรักษาพยาบาลให้กับเด็กชายจิรภัทร ตะเพียนทอง ที่โรงพยาบาลเด็ก - TISCO Foundation donated a medical care grant to Jirapat Tapienthong at the Children's Hospital. 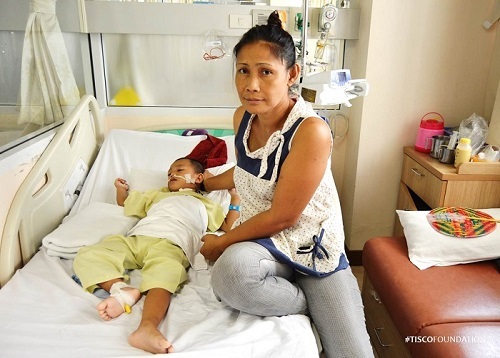 TISCO Foundation donated a medical care grant to Jirapat Tapienthong at the Children's Hospital. Previously, Jirapat had an anoxia which caused him mental and physical disabilities. Now, he has infected lungs and is unable to breath by himself. So, the doctor performed a tracheostomy. The grant includes a suction and an AMBU bag, total THB 9,599, so he can recover at home.